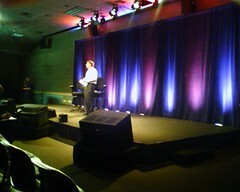 After the live webcast breaking the news that Bill's transition will complete in July 2006, there was an internal meeting (called 'Townhall meetings) with Bill explaining to Microsoft employees the reasons behind his decision and the plans moving forward. After some time Bill gave way to Steve who came on stage. Before he did though, Bill gave away the emotion. It really was touching. 31 years, man. Explaining himself to the several thousand employees, explaining how he was starting the next phase of his extraordinary life, it all got a little too much for him. He held it together though, but he was visibly moved. Steve came up. He thanked Bill, told a few good Bill and Steve anecdotes and went on to describe more about the transition plan and the various execs' new responsibilities as part of the two year process. 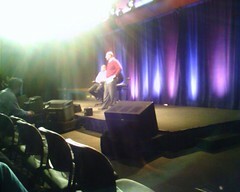 The tother execs were sat in the middle of the front row. I recognised Bach, Johnson, Raikes and Microsoft's new CSA, Ray Ozzie. 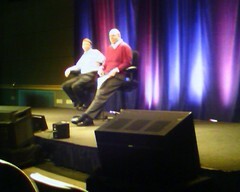 Even Paul Allen turned up. 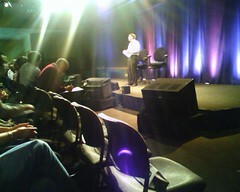 Questions then opened up to the audience. 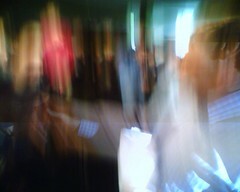 I did queue to ask a question at the mike but before you knew it, it was all wrapped up. As you can see, I was only a few meters away from the small stage. 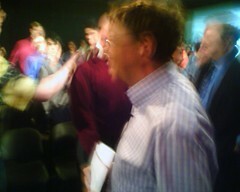 Once the show was over, people came up to Bill to congratulate him. I came over to do the same. It was cool. There was a genuine warmth for him by those there to meet with him and wish him luck. 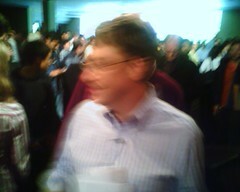 As I shook his hand I said the only thing seemed appropriate: "Good luck Bill, good luck!" And that was that. What an amazing day.